To access existing tests or to configure a new test, click on the Tests link in the QA section on the the main admin page. Create a new test by clicking the Add Test link in the top right hand page of the Tests admin page. The individual fields for configuring a tests are described below. A name that describes what the test is (e.g. something like Temperature (°C) or 0° Gantry - Field Size 10.0x10.0cm - X1 (cm)). Macro name tl;dr: give your test a short variable name like ion_chamber_reading or temperature . Python programmers generally use lower case only variable names with words separated by underscores (_). That is to say a macro name like ion_chamber_reading is preferable to ionChamberReading, IonChamberReading, or Ion_Chamber_Reading. Note that this is by convention only and you are free to choose whichever names you like. It is also highly advised that you use use a descriptive name like ion_chamber_reading instead of something like icr. That way when other people are reading your code it is obvious what your variable represents. The description field is the text that is shown when a user clicks on the test name while performing QA. This description can be made up of plain text or html. 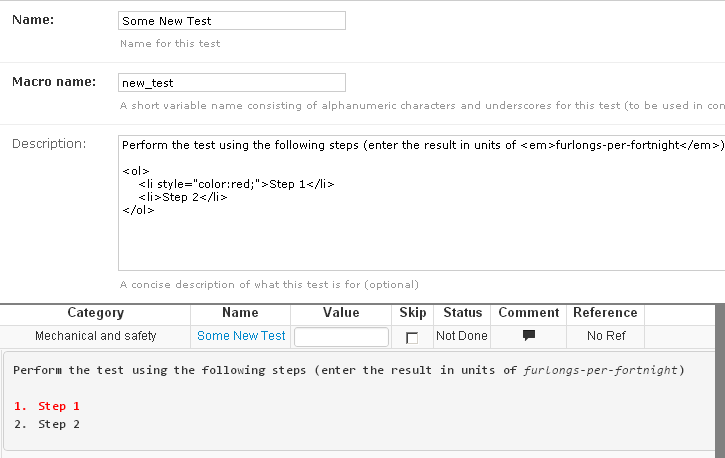 An example showing an html description is shown below along with the way it looks when displayed on the test list page. The procedure allows you to insert a URL to a more detailed procedure available elsewhere. A link to that URL will be shown when the user clicks on the test name while performing QA as shown below. Choose the Test Category that this test belongs to. QATrack+ currently supports 5 different test types as outlined below. Constant A non-user editablenumerical constant to be used in composite tests (e.g. an N_DW calibration factor). When you choose Constant for the Type field a Constant Value text box will appear for you to enter your numerical constant in. Multiple Choice A test where the user selects from a predefined list of choices. When you choose Multiple Choice for the Type field, a Choices text box will appear where you must enter a comma separated list of choices for the test. Composite A value calculated based on other test values (e.g. a temperature pressure correction, or a calculated dose). Composite tests are easy to define but allow users to do define complex calculations with the Python programming language. Please see the Calculated Test Page for more information on defining this type of test. String Composite A Composite test that stores a string (text) rather than a numerical value. Please see the Calculated Test Page for more information on defining this type of test. Upload A test that allows you to upload an arbitrary file and process it with a Python snippet. Please see the Calculated Test Page for more information on defining this type of test. An example of configuring tests and grouping them into a test list is given on our tutorials page. Uncheck this option to hide the test from the charting page. This can help keep your charting page clean and limited to the tests you really care about. Allow auto review of this test? Check this option if you want an image uploaded to QATrack+ to be displayed on the test list page (supported images depend on browser version but generally jpg, png & gif work well).